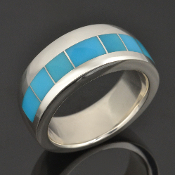 Men's turquoise ring designs in sterling silver by Hileman Silver Jewelry. 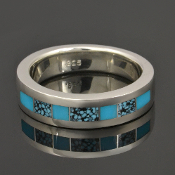 These handmade sterling silver turquoise rings feature spiderweb turquoise inlay as well as plain turquoise in a range of blues and greens. 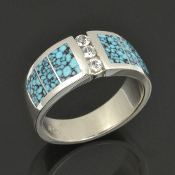 Many of the ring designs you will see are inlaid with turquoise and other colorful materials to accent the turquoise. As with all natural stones, the colors of the turquoise may vary slightly from cut to cut of the same stone and the random spiderwebbing will vary as well. Please allow for some variation in this natural material. 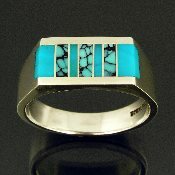 All of our turquoise rings will be made to order in your ring size in 4 to 6 weeks. 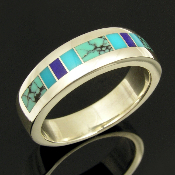 Unique handmade man's sterling silver ring inlaid with spiderweb turquoise and black onyx by jewelry artisan Mark Hileman. 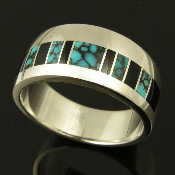 The turquoise is a beautiful sky blue with black webbing. 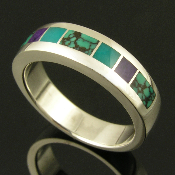 Man's handmade sterling silver ring inlaid with sugilite, gem silica and spiderweb turquoise inlay. Nice blue spiderweb turquoise with dark veining is inlaid in the ends and center sections. 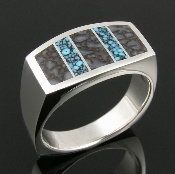 Man's sterling silver ring band inlaid with black onyx and blue spiderweb turquoise. 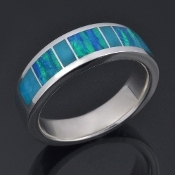 Silver band by Mark Hileman measures 9.5mm wide at the top and is shown in a size 10 1/4. 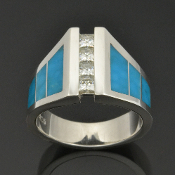 Mark Hileman sterling silver man's ring inlaid with lapis, turquoise and spiderweb turquoise. The ring is 6mm wide and is a size 10. 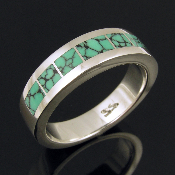 Sterling silver flat top man's ring inlaid with spiderweb turquoise and gem silica by Mark Hileman. High quality spiderweb turquoise is highly sought after and commands a high price in the west. 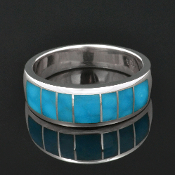 Turquoise and black onyx inlay ring in sterling silver handmade by jewelry artist Mark Hileman. 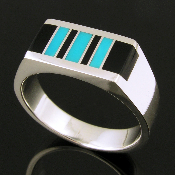 This flat top ring design is inlaid with alternating black onyx and blue turquoise. 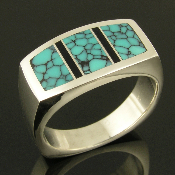 Most of our turquoise rings are inlaid with turquoise from the southwest region of the US with most of it coming from Kingman, Arizona. 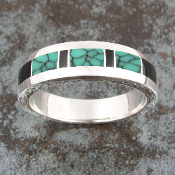 All of our turquoise is natural (no man-made or reconstituted) but some of it has been stabilized.